Chocolate Lasagna – What's for Dinner Moms? My daughter had a friend visiting the other day and I asked them to pick a dessert and make it for dinner. I like to keep the kids busy and doing something productive when they have friends over (I have found it avoids those little squabbles and spats) so that was the best thing I could come up with on the spot. They chose chocolate lasagna which we have never had. I love chocolate and it was a no bake dish. They made a grocery list and off they went. Why have I never had this before? It was creamy and chocolatey. Delicious. As we were eating it we were coming up with new variations to try. Peanut butter cup or butterscotch blondie. We can’t wait to make more. As my daughter noted this recipe used lots of dishes and spoons to make it but that is what dishwashers are for. Clear a spot in your refrigerator to set this dish in before beginning. You will be happy you did. It needs to hold a 13 x 9 casserole dish. Crush cookies in a food processor or with a rolling pin and a plastic freezer bag to a fine grind. Place crumbs in a large bowl and add melted butter. Stir until crumbs and butter are well mixed. Pat crumbs evenly into bottom of 13 x 9 casserole dish. Place pan in refrigerator to set while working on next step. Beat cream cheese in a bowl with a mixer until light and fluffy. Add 2 tablespoons half and half and sugar.Mix together. Gently stir in 1 1/4 cups Cool Whip. 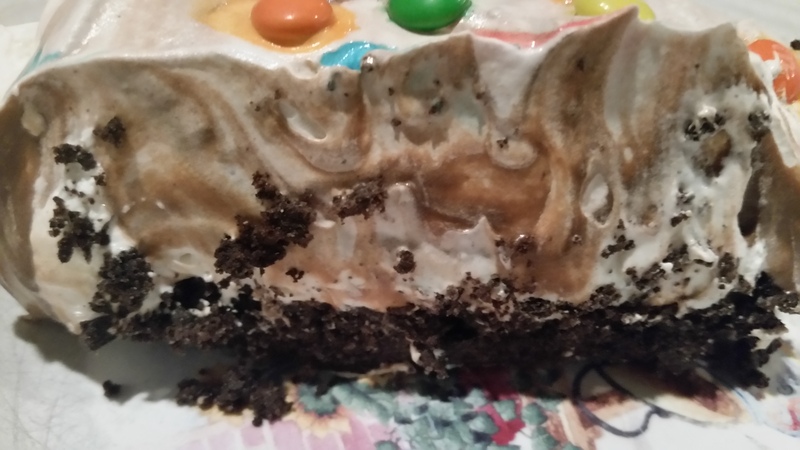 Spread mixture over Oreo crust. Return pan to refrigerator. In another bowl whisk together the instant pudding mixes and the whole milk. Whisk for several minutes until pudding thickens. Spread pudding mixture over the cream cheese layer. Return pan to refrigerator to set for 10 minutes. Spread remainder of Cool Whip over the pudding layer. Decorate with mini M&Ms or chocolate chips as desired. PS: I’m here in Irondequoit……what do I NEED to try at Wegmans?? The chocolate cake if you love cake or anything! But their chocolate cake is my favorite. I live right off of Ridge Road on Bay Shore Blvd……right on the bay. I’m not at Wegmans right now but plan on going tomorrow!! I’m so excited!! Lol chocolate cake!! Yessss!!! Whattttt??!! Omg that sounds absolutely sinful! It was so rich you could only have a small piece but it was so good. I can’t say no to chocolate lasagna. Looks phenomenal! Thank you! Sounds perfect to me. OMG! Thought you were talking about literally adding chocolate in your lasagna! This is such a cute idea. I babysit my little cousins all the time, this is definitely something to keep in mind next time they visit.